MTV chatted with Twentieth Century Fox Co-Chairman and Chief Executive Officer Tom Rothman, who talked about both the sequel to X-Men: First Class and the Fantastic Four reboot. 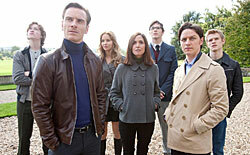 He says that director Matthew Vaughn is definitely back for the X-Men: First Class follow-up and that they’ll start shooting in January of 2013 for a release either Christmas 2013 or Summer 2014. Vaughn is currently developing the script with Simon Kinberg and Jane Goldman, he says. Rothman also mentioned that he does indeed think that Chronicle director Josh Trank will come on board to develop the Fantastic Four reboot. You can watch the segment, in which he also touches on a possible Chronicle sequel, using the player below.